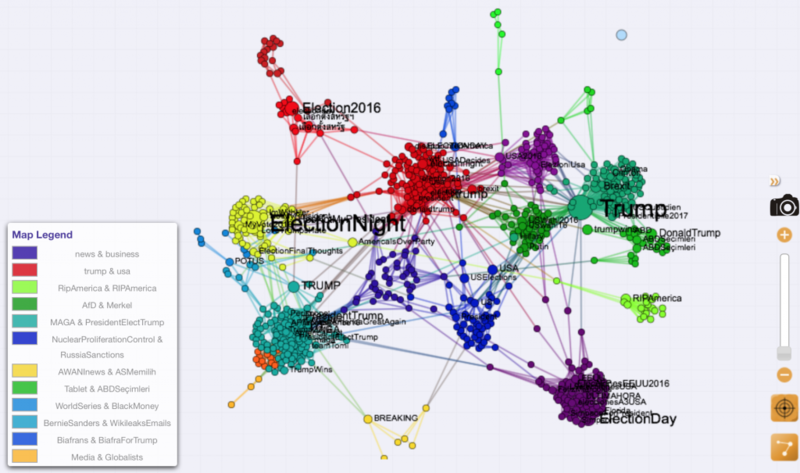 Hashtag cooccurrence network of tweets about Trump (collected thanks to Twitter search API and using the simple query “trump”) during the election night. illustrate the various kinds of concerns raised by Twitter users coming from all over the world (many clusters are also specific to a language (German, Portuguese, etc.)) as Donald Trump was winning the election. As an illustration “#bananarepublic & #notmypresident” cluster is shown left. 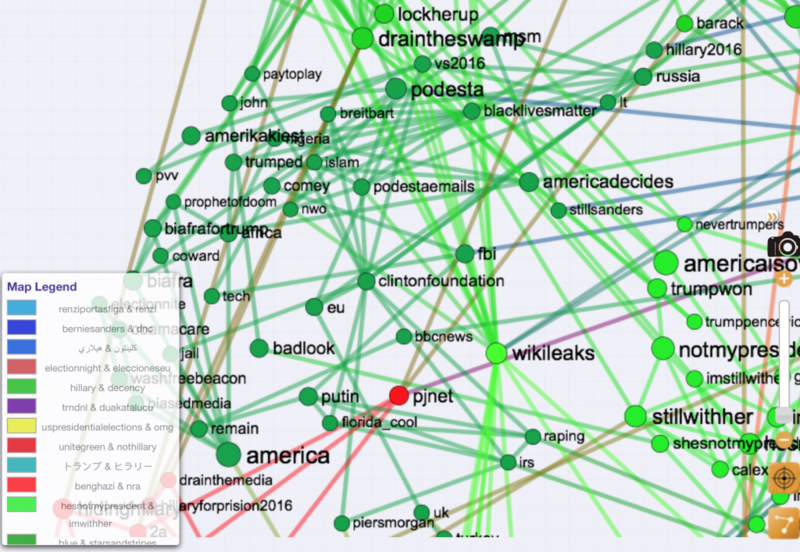 Conversely another hashtag network was produced using tweets collected during the exact same time period and mentioning “hillary”, “clinton” or “hrc”. 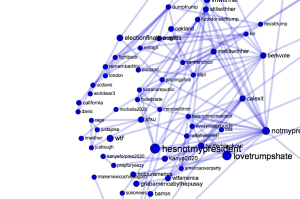 Only 350 000 tweets were found giving shape to the map below. 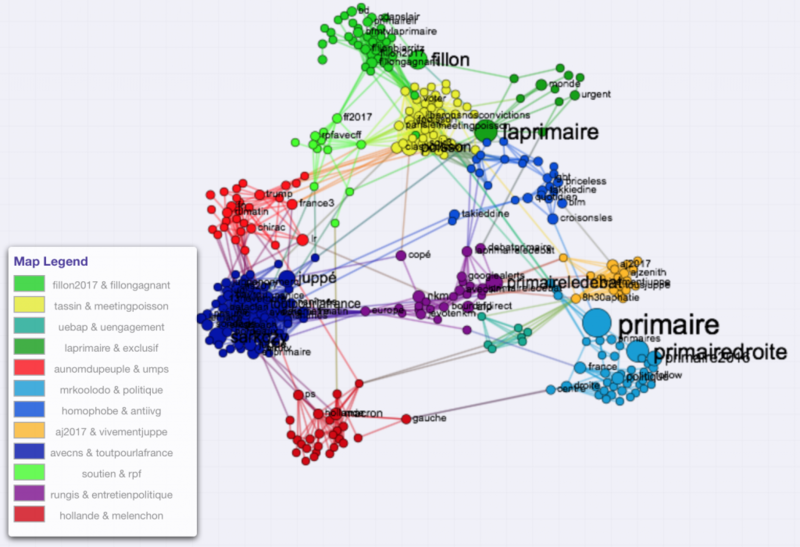 The same analysis has been produced to map the right primaries in France. 303 428 tweets were published during the week preceding the first tour of the elections (12 novembre 2016 – 21 novembre 2017). 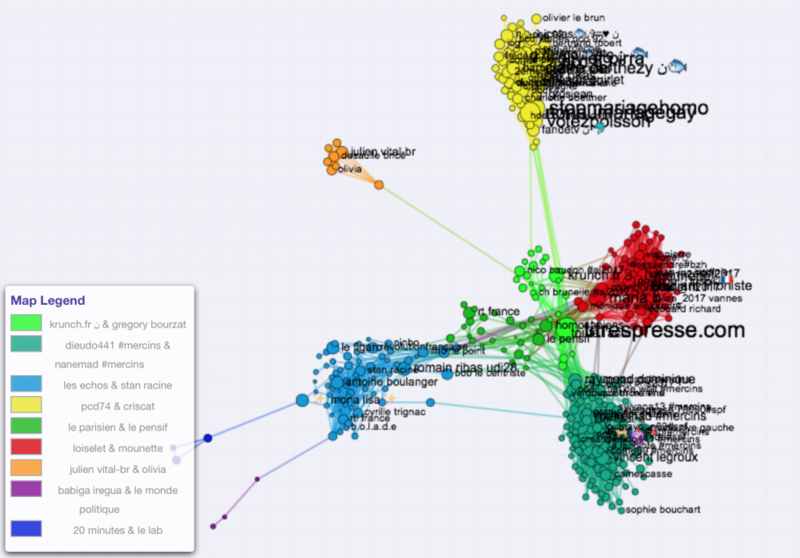 More interestingly, it is also possible to map Twitter user map, linking two users when they share the same hashtags. 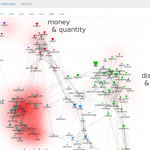 Of course proximity between accounts is then reduced to the presence of a few hashtags that does not necessarily equate with a political agreement, but it already gives an idea of the strong difference in the topics discussed in each political family. Indeed, it seems that very clearly-cut communities organized around each candidate naturally emerge from this analysis. Reading the name (or even observing emojis) allows to learn a lot about the composition of each group. standing out in a very dense cluster. Juppé supporters show right in the center of the map, but they are definitely less active than other candidates’. 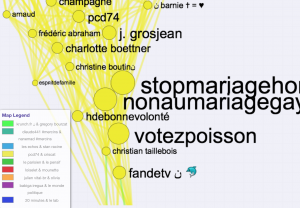 Poisson, backed by numerous Twitter users standing for #mariagepourtous movement is clearly in a peripheral position, suggesting most of his campaign themes were not shared with his opponents.